Steven Millhauser Collection: Edwin Mullhouse, Portrait of A Romantic, In The Penny Arcade, From the Realm of Morpheus, The Barnum Museum, Little Kingdoms, Martin Dressler, The Knife Thrower, Enchanted Night, The King in the Tree, Dangerous Laughter, We Others. First editions of the first twelve volumes of Millhauser’s books. Octavo, 12 volumes. Each are fine in fine dust jackets and each are signed by the author. A very sharp collection by a master of the short story. 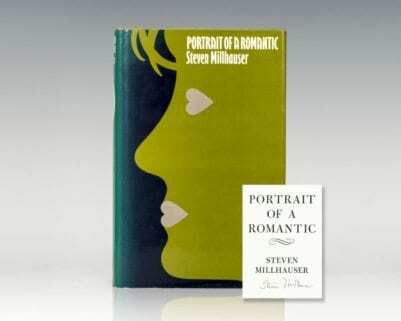 Steven Millhauser is best known for his 1972 debut novel, Edwin Mullhouse. The novel is seemingly autobiographical, and it's about a precocious writer whose career ends abruptly with his death at age eleven. Millhauser followed with a second novel, Portrait of a Romantic (1977) and his first collection of short stories In The Penny Arcade (1986). In 1997 he won the Pulitzer Prize for fiction for Martin Dressler and, in 2012, the Story Prize for We Others. Steven Millhauser Collection: Edwin Mullhouse, Portrait of A Romantic, In The Penny Arcade, From the Realm of Morpheus, The Barnum Museum, Little Kingdoms, Martin Dressler, The Knife Thrower, Enchanted Night, The King in the Tree, Dangerous Laughter. Uncorrected proofs of the first editions of the first eleven books by Pulitzer Prize-winning author Steven Millhauser. Octavo, 11 volumes, original wrappers as issued. Each are in near fine to fine condition. Each volume is signed by Steven Millhauser. An uncommon set of proofs. Edwin Mullhouse: The Life and Death of an American Writer 1943-1954. First edition of the author’s first book. Octavo, original cloth. Signed by Millhauser on the title page. Fine in a near fine dust jacket with the lightest of wear. Jacket design by Alice and Martin Provensen. London: Routledge Y Kegan Paul, 1978. First British edition of the author’s second book. Octavo, original cloth. Signed by Steven Millhauser on the title page. Fine in a fine dust jacket. 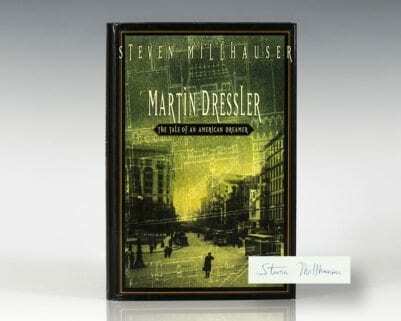 Martin Dressler: The Tale of an American Dreamer. New York: Crown Publishers , 1996. First edition of Millhauser’s Pulitzer Prize-winning novel. Octavo, original half cloth. Signed by Steven Millhauser on the title page. Fine in a fine dust jacket. Jacket design by Joni Werner. Author photograph by Emma Hanson. Uncorrected proof of the first edition of the author’s Pulitzer Prize- winning novel. Octavo, original beige wrappers. Signed by Steven Millhauser on the title page. In fine condition.